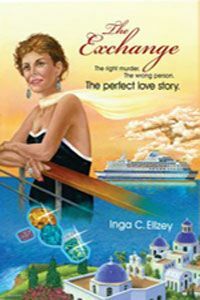 The Exchange by Inga C. Ellzey: Synopsis and Online Purchase Options. Synopsis (from the publisher): After seven years in the Witness Protection Program, Jewelle Dawson hopes to regain her freedom and her identity by embarking on a one-month Mediterranean Cruise. With full knowledge that the Gambrelini mob is still hunting her and despite desperate pleas and warnings from John Murray, her Witness Protection Officer, Jewelle flies to Barcelona and boards the luxury cruise ship, the Emerald of the Seas, in search of interesting new friends, a fresh beginning, and hopefully … romance.